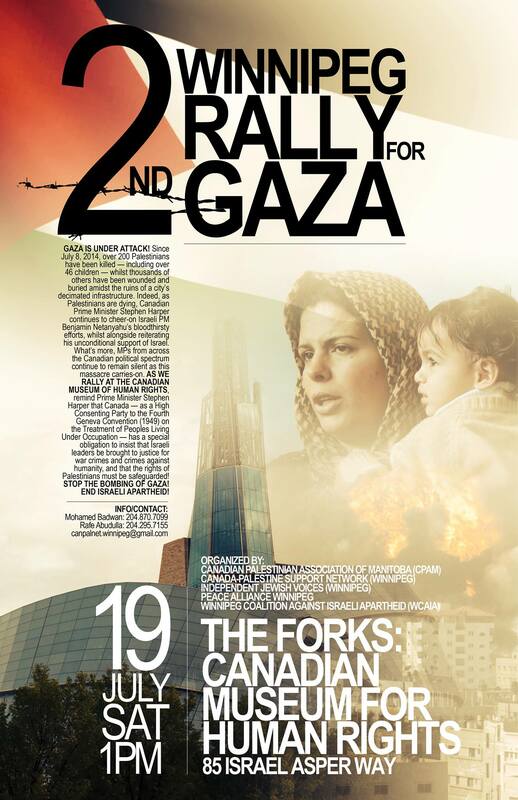 WINNIPEG—The Winnipeg Coalition Against Israeli Apartheid (WCAIA) is holding a commemoration of Al Nakba in Memorial Park on Sunday, May 15, from 1-4 pm. 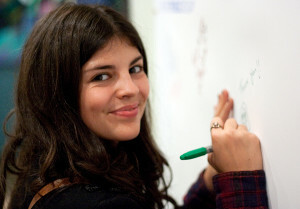 WCAIA and partner organizations representing Palestinian and Jewish communities and peace activists will host an afternoon of speakers, workshops, and culture. Those refugees now number 5 million. Bassam Hozaima’s story is similar to those of many Palestinians. His grandparents were forced out of their home in al-Ramla, Palestine in 1948. 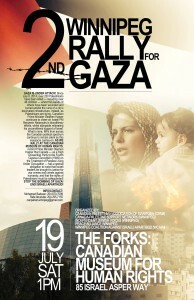 Hozaima was raised as a child in Gaza, and moved to Canada with his father at the age of 11. He has not been able to return to Israel or the Occupied Palestinian Territories since then, but he works locally to raise awareness about Palestine. He, along with survivors of the Nakba, will be speaking at Sunday’s event. The organizers acknowledge that this event takes place on unceded Indigenous land, part of Treaty 1 Territory and the heart of the Métis nation. We support the land rights and human rights of Indigenous peoples in Canada and worldwide. 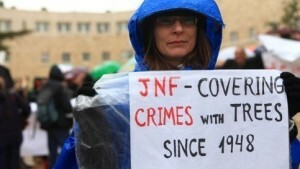 Al Nakba is Arabic and means “the catastrophe”. This event is to commemorate the 1948 displacement and dispossession of Palestinians from their homes and lands, creating the longest-standing refugee crisis in the world. For 68 years, Palestinians have experienced Al Nakba, and for 68 years Palestinians have resisted, working for peace and justice. The organizers acknowledge that this event takes place on unceded Indigenous land, part of Treaty 1. We support the land rights and human rights of all indigenous peoples, in Canada and worldwide. Portage Avenue to Memorial Blvd. 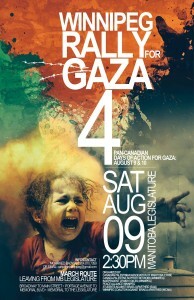 GAZA IS UNDER ATTACK! Since July 8, 2014, 245 Palestinians have been killed — including 46 children (as of this writing) — whilst thousands of others have been wounded and buried amidst the ruins of a city’s decimated infrastructure. Indeed, as Palestinians are dying, Canadian Prime Minister Stephen Harper continues to cheer-on Israeli PM Benjamin Netanyahu’s bloodthirsty efforts, whilst alongside reiterating his unconditional support of Israel. What’s more, MPs from across the Canadian political spectrum continue to remain silent as this massacre carries-on. As we rally at the Canadian Museum of Human Rights, remind Prime Minister Stephen Harper that Canada — as a High Consenting Party to the Fourth Geneva Convention (1949) on the Treatment of Peoples Living Under Occupation — has a special obligation to insist that Israeli leaders be brought to justice for war crimes and crimes against humanity, and that the rights of Palestinians must be safeguarded! 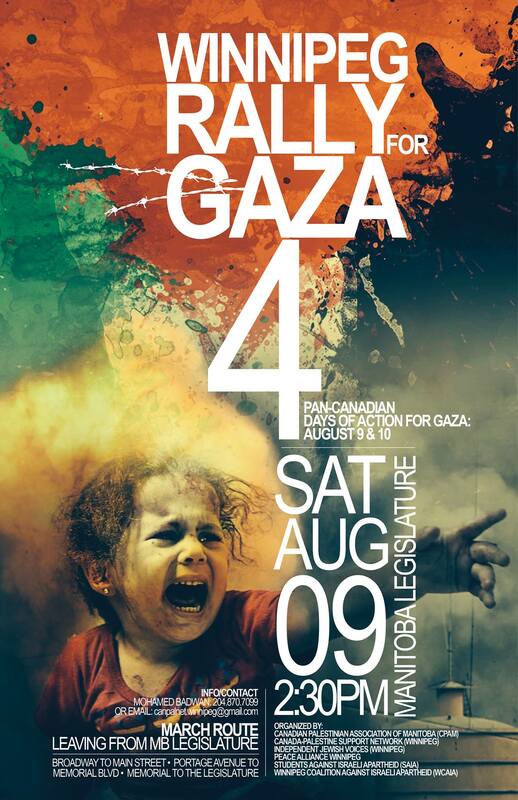 STOP THE BOMBING OF GAZA! Protests are being organized in cities around the world in response to the ongoing, collective punishment of Palestinians. Since the June 12 disappearance and killing of 3 Israeli settler youths, Israeli forces and civilians have killed more than 180 Palestinian civilians (including dozens of women and children) and wounding more than 1,000 others — this, whilst carrying-out over 1,100 merciless airstrikes on Gaza. 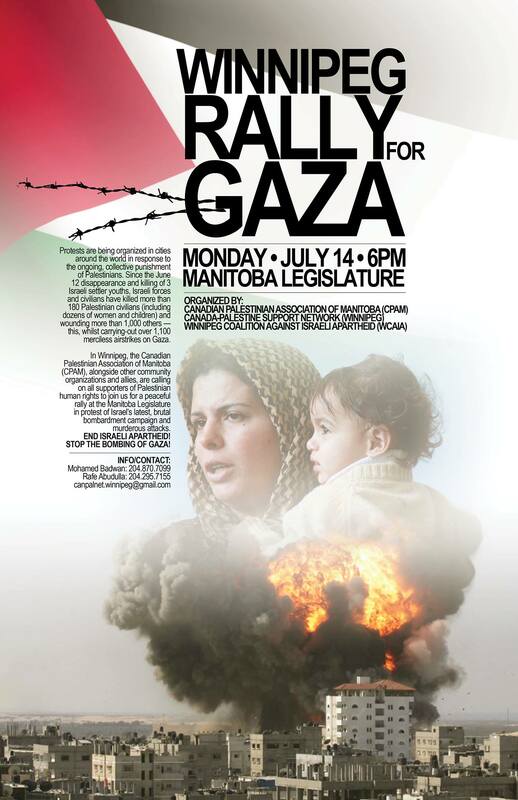 In Winnipeg, the Canadian Palestinian Association of Manitoba (CPAM), alongside other community organizations and allies, are calling on all supporters of Palestinian human rights to join us for a peaceful rally at the Manitoba Legislature in protest of Israel’s latest, brutal bombardment campaign and murderous attacks.